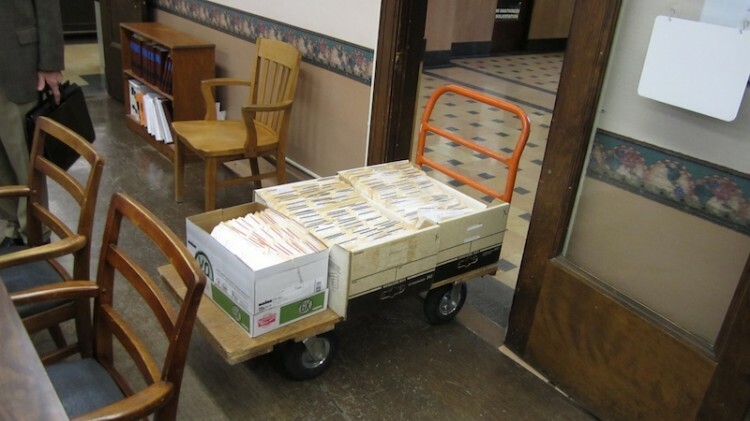 Mr. Meara came through with a cart with all the tax foreclosure cases. He was taking them up to file in court. He wanted to show he commissioners what 193 foreclosure cases looked like. Jennifer Miller-Connet works for Fort Scott broadcasting and lives in Vernon County. She says she was headed into Bourbon County at 4 am to open Radio Shack up for Black Friday. She hit potholes that caused $803 worth of damage near the state line. She feels like as a tax payer the road should have been taking care off. She said there was no way to drive around the holes. Chairman Endicott asked how many miles were on her car. She said 125,000 miles and that the car is a low riding Mazda Protege. She felt that there should be some type of compensation from the county. The commissioners said that she should file an insurance claim and the insurance company would make a determination. The commissioners decided to buy 50 culverts from Judy’s Iron and Metal. The rock crusher came in Monday. They are looking at getting a couple Ricoh G700 SE GPS cameras to give to the road crews to take photos of things that can be placed on the GPS maps. The cost of the two cameras will come to $2,901. The county has sold some data to a mapping company so the funds are available for the purchase. They are also planning on buying a label gun to put labels on signs so if one is found in the ditch, the county will know where it came from. The date for the lawsuit related to the sewer district has been bumped back. The County Attorney pointed out that this is an existing case–not a new lawsuit. They date has been bumped back as further discovery is done and it is expected that it won’t actually go to court until next year. Mr. Meara came back at 10:30. Defendants of foreclosure lawsuits that live in KS will be notified by the sheriff. Defendants out of state will be notified by certified letter. Everything has been filed that Mr. Meara was given that was possible to file. He is going to give the commissioners a list of the properties that have not yet been published and that he was unable to file. Those will need to be published. There may be some from 2008 and 2009 that need to be published as well. Mr. Meara said there were 17 to 25 properties that were not published in 2007. He said that it was probably just an oversight on the part of the Treasure’s office and that there didn’t appear to be any pattern. They did not appear to all be payment plan properties. Terri Johnson (County Attorney) said it appears that the redemption period starts at the date of publication and that the publication must occur for the property to be property “bid off.” So properties that were not published for 2007 taxes will need to be published before the three year redemption period can begin. Commissioner Endicott said that it didn’t seem right that someone could have not paid their taxes for three years and then they get another three years if they were left out of the publication. The law does allow for there to be errors and omissions in the publication. However, this allowance seems to be more aimed at preventing people from saying their property was improperly foreclosed on due to a printing smudge or mistake and may offer less protection for the county if proper procedure wasn’t followed. Partial redemption cannot be invoked once the county files the foreclosure. So once the county files the foreclosure paperwork, those properties must have their taxes, fees, and interest paid in full in order to avoid a tax sale. There was some discussion as to whether or not a non-homestead property could be partially redeemed before the county files for foreclosure. The scenario would be a business that had unpaid taxes since 2007 that paid their 2007 taxes in order to remove it from foreclosure lawsuits that Mr. Meara filed this morning. The statutes appear to only mention partial redemption under the section that applies to homestead properties. The other sections seem to indicate that once a property is bid off to the county, the entire amounted owed on that property must be paid in order to avoid foreclosure. It appears that non-homestead properties have been allowed to partial redemption in the past and the attorneys were not clear if the statues indeed prohibit partial redemptions for non-homestead properties. They are going to look into it to see. The lawsuit summons from last week was not a new lawsuit. I do not understand why the County has yet to consult the AG’s Office in regard to their questions concerning the statutes (laws) because obviously, these questions have been lingering for 2 or 3 months now with no answers. If the County would start reimbursing for damage by the poor condition of the roads, no one could afford the taxes here and we can barely afford them now! Thats kind of funny. If I hit a pothole and did $800 of damage to my car, I’d assume it was my fault for driving to fast. I don’t think it would cross my mind that the government needs to pay for it. What inspires this type of thinking around here? I just read the minutes and saw that Joanne Long submitted this to KCAMP – does anyone know what that is? I think others need to be aware of this as I am sure many have had damages because of the condition of the roads. That should apply to city streets also because it is part of the county, right? There are some places in town at the intersections where even driving like 2 miles per hour, my car still hits bottom so I avoid them even if it makes my trip further! Guess I don’t need to use commonsense anymore? I have a question, when was the 2006 names published? That is the year that the treasurer quit putting the names of the payment plan in the paper. I see we are talking about 2007 but we would like to know when she published 2006. This is such a mess, we cannot afford to let this just go on. The old saying that a tiger seldom changes stripes also applies to other things also. The statue said all names of delinquent taxes will be published and the year of 2006 the treasurer became delinquent on her taxes, so she decided to hold certain people ‘s names out of the paper including her own and now the county is having to face this mess . People that were not published are being held off another 3 years while others have property going to the tax sale. If you think this is unfair and costing taxpayers more in taxes, I suggest you call your commissioner and let them know that you do not think this is fair and why was this redemption laws not laid out before we started this tax sale to see what the statues read. What a mess!!!!!!!!!!!!!! I am disappointed that the lawyer doing the sale and the county attorney did not contact the State office and find out how the law on redemption reads. If you knew that the computer was in error and you continued to use it , then explain to us why. I think the lawyers do know how the law reads. There are some very good reasons for having a specific procedure to follow before the government is allowed to take property away from citizens. If the government didn’t follow those procedures, it is likely that any attempt to foreclose would be thrown out of court. A lawyer knowing this isn’t willing to sign off on saying that the foreclosures are valid when he/she knows there are obvious procedural problems. While this may mean that some people have more tie to pay their taxes, it is a protection that is well worth having. But not paying isn’t really a very good deal. The interest rate is high enough that there isn’t really an economic incentive to do so unless they plan to just abandon the property when it does eventually go to the tax sale. But, Mark, you are talking in a perfect world. Interest was not paid by everyone so for some, it was the perfect deal. And, it has been at least 3 months since some of these questions came up and there does not seem to be a plan of action. Surely, with the guidance of the Attorney General’s Office, there should be a clear plan of action at this point and there is no reason that should not be shared with the public. From the beginning they have acted like the statutes were a true mystery to them, all of them. Really, just pick up the darn phone or send an email and get a decision. We went from one category, “Names of Delinquent Taxpayers Published” to add a second category “Names of Delinquent Taxpayers Published but on the Payment Plan” to yet a third category of “Names of Delinquent Taxpayers Not Published and Not on the Payment Plan”. Seems like that has to cover just about everyone now. My mind just draws a blank and as I try to draw from my past where I have seen something similar to this, I see the “Three Stooges” playing in my mind! I understand why the procedure is important and that is why I am so angry that the County has blown off the laws in the first place but I do not understand why they feel the correct procedures should be kept secret from the taxpayers unless they feel that we will try to hold them to those correct procedures in the future. Welcome to Bourbon County, Kansas: Taxation without representation! Besides having to deal with the County Treasurer incompetence or willful disobedience to the letter of the law, now we’re having to deal with the Commissioners not knowing either what to do or deciding to not ask the state. Duh, this is a no brainer. Please tell me again what would possibly induce me to pay my taxes on time?